It is still summer for two more weeks, and the weather here is lovely! How are you faring in your corner of our beautiful planet? Where ever you are, I wish you well. August was a month of resting for me. I have begun on my nightie, just a simple beginner's stitch. One day last month I was able to visit a local garden. This is their newest pond. 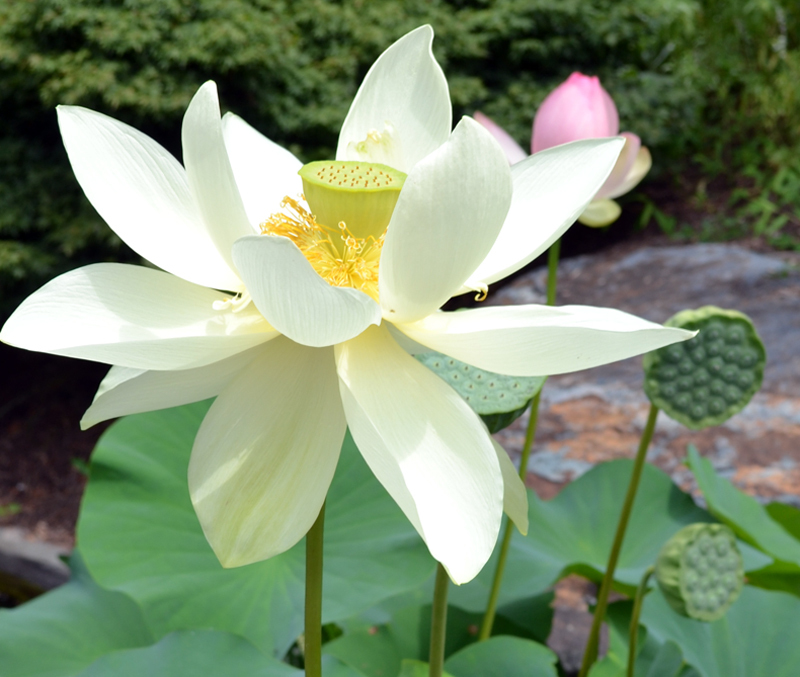 and it is at Sarah Duke Gardens. She is as large as my hand. And another sister opening to her fullest potential! This trip was an delightful summer pleasure. what I did on my time off. I am enjoying catching up with as many of your blogs that I can. I am seeing some wonderful things. The garden is full of beauty. Your photos are beautiful! We missed you- but understand, and are VERY happy you enjoy your creative time away from your pc. Big hugs. Have a wonderful weekend. 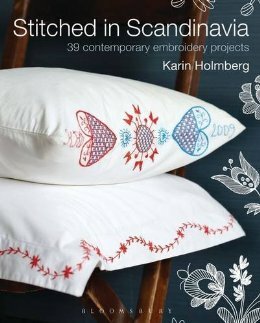 I love these pajamas patterns, they're charming, specially with your embroidery! I have been doing needlework also, so relaxing and fun, my favorite TV past time. 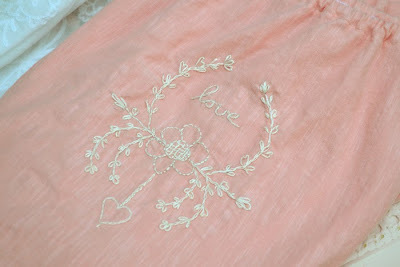 My favorite is SRE (silk ribbon embroidery) you can create beautiful flowers and grow your own garden on a quilt:) Your night gown look divine and you must love wearing it. Welcome back. Love all your photos. 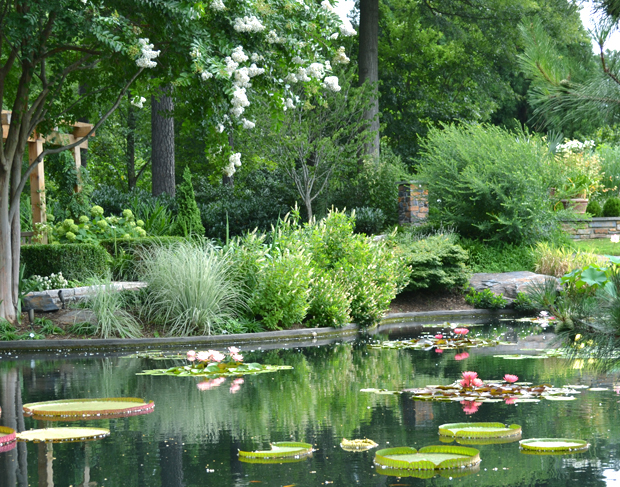 The pond is especially gorgeous. I remember, way back when, when I sewed my own clothes. I have a small sewing machine that has never been out of the box. So far, no itch to get it out! Good morning Terri and I have to say for a beginner the "nightie" looks fabulous! Those gorgeous flowers are so beautiful and what a lovely pond you have to visit! The weather here has been cooler than usual and it's expected to rain later today but Fall in upstate New York is fickle and although the leaves have not begun to change yet there is a definite nip in the morning air. I hope you have a wonderful weekend and keep on stitching! Loving that nightgown you made and the photos are beautiful!!! Your pictures here as so pretty! Love the sewing project too! This gave me a peaceful exhale. At first I wondered how you could step away from your computer for a whole month. Now I wonder how you came back. The key is balance, I suppose. As with everything. Sounds and looks like you had a wonderfully productive month. I hugely admire your will power in staying away from online media in this way. I'm sure I would be unable to do so myself. But I can see the benefits of giving yourself a rest from all that ever present demand on your time. I will try and practice by giving myself days free from computer interference. Love those books, by the way! What a beautiful garden! It looks so serene. 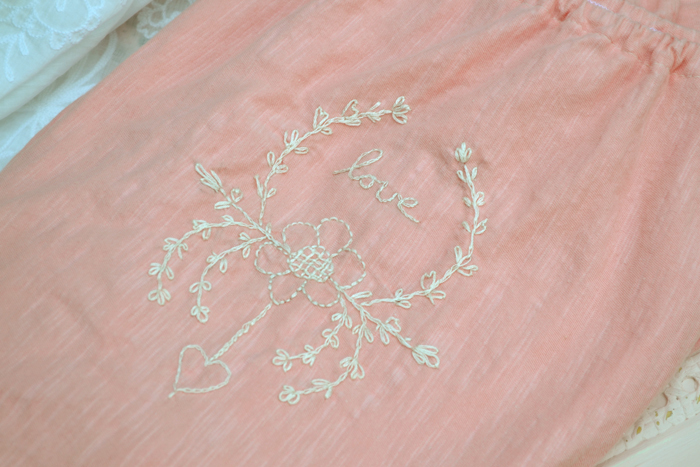 I love your pretty nightie; gorgeous shade and the stitching is very sweet. Hope you're having a lovely weekend. I love your gown.....It really looks like an heirloom. And has inspired me to try my hand at making one, when I get my sewing machine back from the repair shop. And, the garden pictures are just lovely. your pjs look extra comfy..what a great way to spend your time away. Yeah YOU! You made jammies AND did embroidery on the top. I bow to you, sweet Terri! You will be for sure having lovely dreams when you wear them, I'm positive! 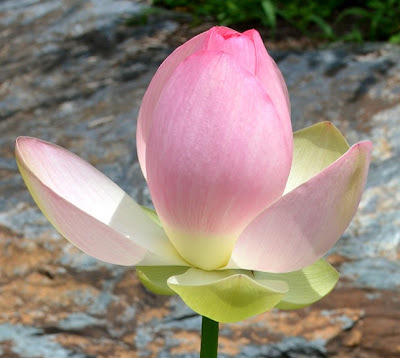 Wow, the Lotus are stunning. 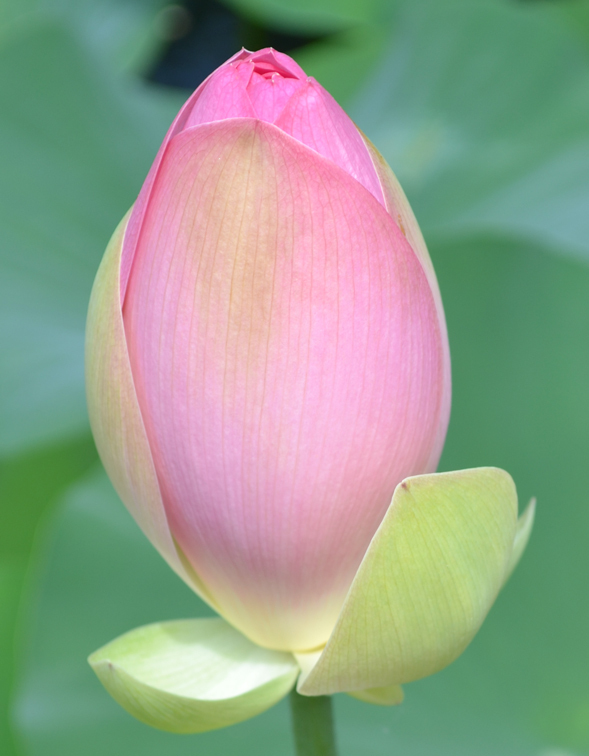 Each opening is more beautiful than the last one. How I wish we could grow them here! Glad you are rested and feeling better. Seems a respite is just what the dr ordered! 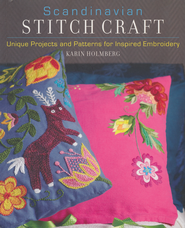 Your embroidery is precious and beautiful and just perfect, so light and dainty looking! I am so happy you got rest and relaxation but I am also happy to see you back, now it feels like blogging again! I love seeing your trip to the garden, it is wonderful....the lotus are so gorgeous, it must have been a thrill to see, a wondrous memory too! 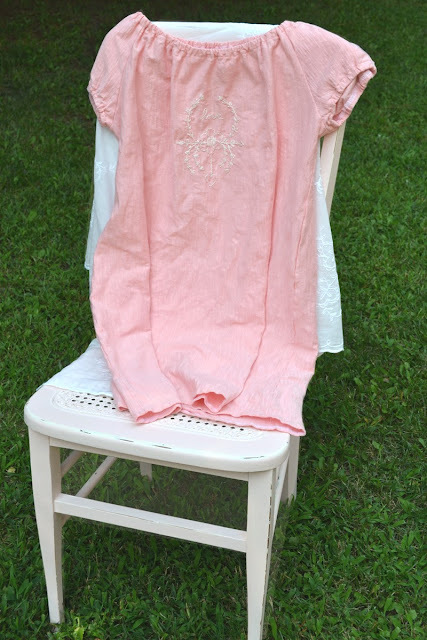 Such a pretty nightgown... learning to sew is something else I'd love to do! Truly enjoyed the stunning flowers.